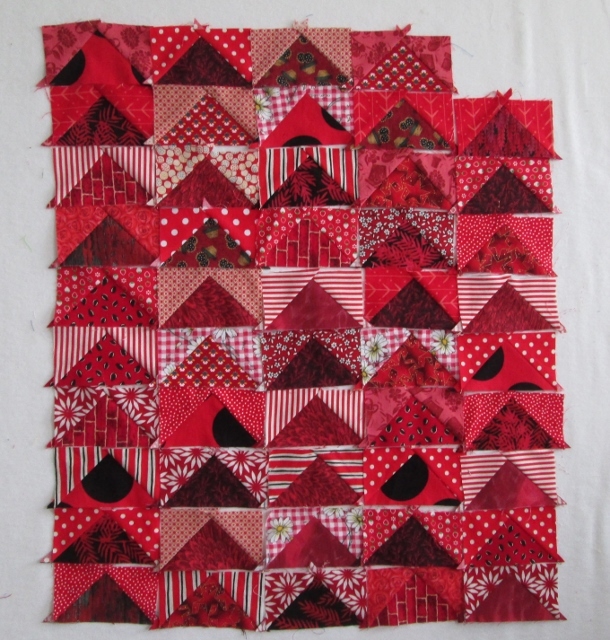 Two weeks ago I showed off some Red scraps, while in the past two weeks I got more done. First off is the flying Geese blocks. One short of 50. 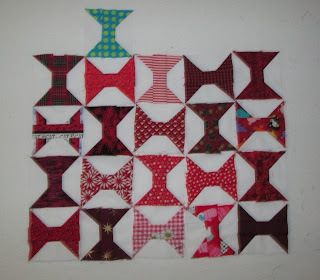 I have added this post to Soscrappy's RSC 2013 linky page for today. I also got the little 16 patches done. They measure 6 1/2" sq. I love how the red twinkles. I just got back from Horse camp. 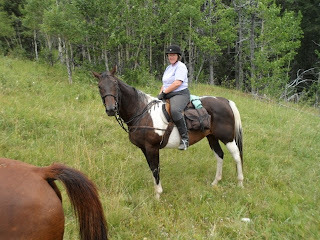 We take the horses to the mountains and camp and trail ride all day long. So much fun. 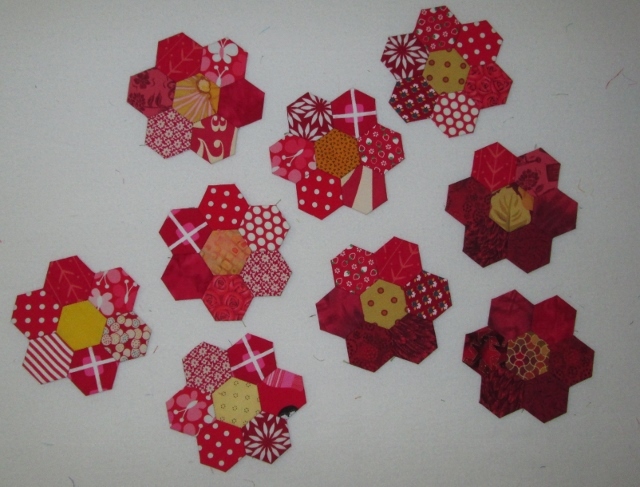 I took my Hexagons with me and got some hand sewing done. So a few more flowers to show. My Leaders and Enders spools are coming a long. I found one last Blue Green spool from last month. I also got a few apples done. I found this pattern last fall but now the cutting is all missing. So I had to recreate them. Next I hope to do some apple cores. Here is a quick photo of me and my horse. I will get the photos from my husband and show you more. I forgot to take my camera so he took all the photos. So far this is all I have seen. Love the Flying Geese - are you using a particular tool or technique? 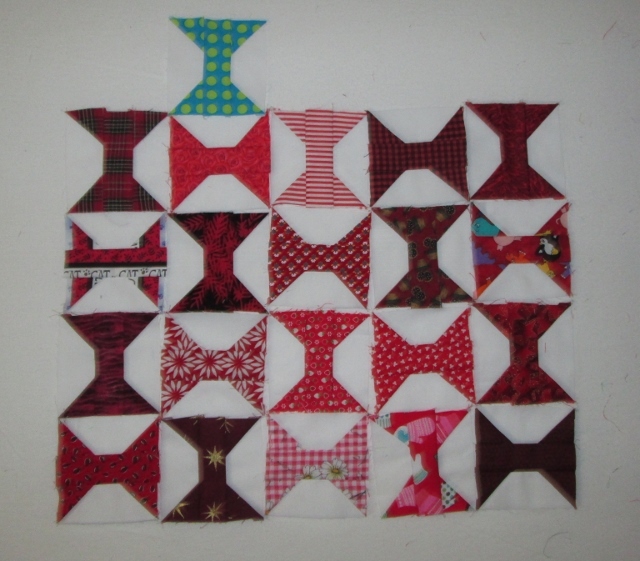 I love the look of Flying Geese blocks in a quilt, but get aggravated with the fiddly-ness of making them accurately. All your other red blocks look wonderful as well. I'm impressed that your 16 patch blocks are only 6 1/2 inches! Your time at horse camp sounds fun - looking forward to more photos! Lots of nice red scrappy things happening here, I particularly like the pop of green in the 16 patch. 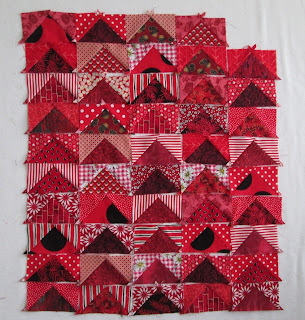 You have so many great red scrap projects! I especially love your flying geese and spools. You got an amazing amount done. The flying geese look great and the apples are really cute. 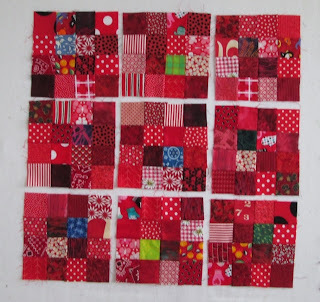 Lots of pretty reds sprinkled about in your blocks. I just love the hexie flowers. The apples are wonderful.... I really need to start getting my fall things out. I know I have an apple quilt with cores in the closet somewhere. So fun to follow all your scraps blocks Looking forward to see some finishing quilts. 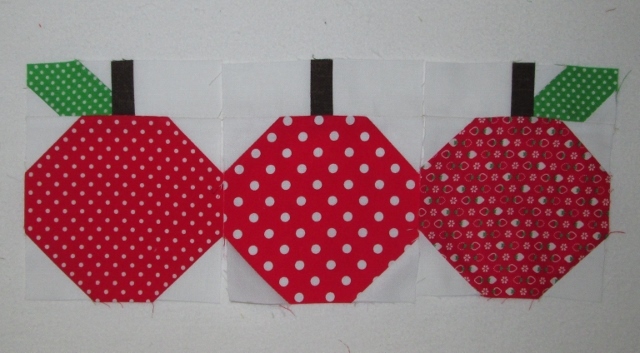 Oh Cathy - I love all your yummy red blocks! Especially the apples - they look good enough to eat :*) You're looking good up there on that horse girlfriend. What a beautiful horse!